00:33 A SERIES I, IN SOME WAYS, DISLIKE MAKING, BUT HAS TO BE MADE. 00:39 OUR GUEST IS WALID SHOEBAT. 00:41 HE'S BEEN WITH US BEFORE. 00:42 HE STARTED OUT AS A MUSLIM AND A TERRORIST, A GENUINE PALESTINIAN TERRORIST. 00:46 HE MET CHRIST AND HE'S SAVED AND HE'S GOT SO MUCH INFORMATION FOR US. 00:51 FIRST WE'LL GO TO LOCATION IN >>JERUSALEM ON THE MT. OF OLIVES. 00:55 WELCOME TO THE CENTER OF THE EARTH. 01:08 AND OF COURSE, MOST OF JERUSALEM. 01:10 IT HAS A WONDERFUL HISTORY AND IT'S IN CONTENTION TODAY AS IT >>ALWAYS HAS BEEN. 01:22 PLUS THESE THINGS BEAR REPEATING >>I THINK. 01:24 THE HISTORY OF THIS MOUNTAIN, >>SO FAR AS JEWISH OCCUPATION OF THE PLACE STARTS WITH ABRAHAM. 01:36 HE MADE A JOURNEY TO JERUSALEM >>FROM BEERSHEBA. 01:45 PRETTY MUCH WHERE YOU SEE THE >>DOME OF THE ROCK STANDING TODAY. 02:04 HE PURPOSED TO BUILD A TEMPLE TO >>GOD HERE ON THAT MOUNT. 02:09 OF COURSE THERE WERE NO DOMES OR ANY OF THOSE BUILDINGS IN THOSE TIMES. 02:13 IT WAS REALLY JUST AN EMPTY >>MOUNTAIN AND A SMALLER MOUNTAIN. 02:16 WE'RE UP ON THE MT. OF OLIVES, >>WHICH AS YOU CAN SEE IS MUCH HIGHER THAN MT. MORIAH. 02:21 SO, WE ARE LOOKING AT A BUILT UP SITE, >>WHICH WAS BACK THEN JUST EMPTY. 02:30 WELL, DAVID BEGAN TO COLLECT MATERIALS. 02:32 HIS FRIEND HIRAM, THE KING UP ON >>TYRE SENT CEDAR WOOD. 02:43 BUILT THE FIRST TEMPLE OF GOD ON THIS MOUNTAIN. 02:49 YOU WOULD SEE THE JEWISH TEMPLE >>RISE SOME 3000 YEARS AGO. 03:09 AND TOOK AWAY THE ARTIFACTS >>AND SET FIRE AND JUST DESTROYED >>THE WHOLE PLACE. 03:19 BUT THEY FINISHED IT OFF AND THEY CARRIED BACK CAPTIVES TO BABYLON. 03:27 EZEKIEL IN THE STREETS WITH THE PEOPLE AND THEY CHRONICLED THE >>TIMES FOR US. 03:37 ACCORDING TO THE PROPHECY OF JEREMIAH 29:10. 03:46 AND THEN ZERUBBABEL LAID THE >>FOUNDATIONS OF THE 2ND TEMPLE. 03:54 IN THE MANNER THAT THEY'RE >>FIGHTING WITH THE PALESTINIANS >>AT THIS TIME. 04:00 BUT IN THE MANNER THAT THEY'RE >>POLICING THE PALESTINIANS. 04:04 ZERUBBABEL WAS THOUGHT TO BE >>CRAZY AND SOME SAY HE WAS CRAZY. 04:11 HE MIGHT HAVE BEEN, BUT THAT >>DOESN'T DISQUALIFY YOU TO BE A >>SERVANT OF GOD. 04:26 REFERRED TO THIS TIME AS ZERUBBABEL'S TEMPLE. 04:43 THE FESTIVAL OF HANUKKAH, THE FEAST OF DEDICATION AS THEY REDEDICATED THE TEMPLE. 04:48 THE THING STOOD THEN UNTIL KING HEROD AND HE BEGAN TO REMODEL IT >>IN A MOST PROFOUND WAY. 04:57 IT BECAME A HUGE CONSTRUCTION, >>GREEK-ROMAN STYLE. 05:04 AT LEAST THE EQUAL OF SOLOMON'S >>TEMPLE AND INTO THAT TEMPLE, OF COURSE, CAME THE MESSIAH. 05:16 WHICH YOU SEE BEHIND ME IN THE EASTERN WALL JUST NORTH OF THE >>DOME OF THE ROCK. 05:22 THE PEOPLE DIDN'T PARTICULARLY >>APPROVE OF THIS ROMAN CONSTRUCTION. 05:39 HE HONORED THE PLACE WITH HIS PRESENCE. 05:42 BUT, GENERATION LATER, >>AS ALWAYS IN ISRAEL'S HISTORY, >>THERE WAS MORE TROUBLE. 05:48 THE ROMANS LAID SIEGE TO THE PLACE IN 67 A.D.
05:51 AND THE CONQUEROR TITUS, THE ROMAN GENERAL COMPLETELY WRECKED THE PLACE. 06:01 IT WAS ONE OF THOSE TRAGEDIES >>THAT SEEM TO OCCUR FROM TIME TO >>TIME IN JEWISH HISTORY. 06:22 THE JEWS HAD FOMENTED A REVOLT UNDER BAR COCHBA, A FALSE MESSIAH. 06:29 HE LEAD A REVOLT AGAINST HADRIAN >>AND THE ROMANS AND IT WAS TERRIBLY UNSUCCESSFUL. 06:35 IN TITUS' INVASION, 1.1 MILLION >>JEWISH PEOPLE WERE KILLED. 06:39 IN HADRIAN'S PUTTING DOWN OF THE >>REBELLION IN 135 A.D., ANOTHER 580,000 WERE KILLED. 06:53 NOT UNLIKE THE HOLOCAUST IN OUR OWN TIME. 07:03 CONTINUED THROUGH ALL THESE YEARS, BUT NOW IN EARNEST, THE JEWS LEFT THE LAND. 07:08 THERE WAS NOTHING TO BE HERE FOR. 07:16 THERE WAS A TEMPLE TO A ROMAN >>GOD AND THAT CERTAINLY KEPT THE >>JEWS OFF THE MOUNT. 07:54 AFTER THE BIRTH OF MOHAMMED, THE MUSLIMS RODE IN. 07:56 THEY FOUGHT WITH THE BYZANTINES AND THEY BUILT THEIR OWN SHRINES. 08:03 THE DOME OF THE ROCK, WHICH YOU >>SEE WAS BUILT IN 691 A.D.
08:18 WE COME TO 1099 AND MORE CHRISTIANS BACK FROM EUROPE, THE CRUSADERS. 08:29 AND TEACHING LOVE AND IT WAS A TERRIBLE TIME. 08:32 AT ONE POINT THEY HERDED 1100 >>JEWISH PEOPLE INTO A SYNAGOGUE >>AND BURNED IT TO THE GROUND. 08:38 IT WAS A TERRIBLE TIME FOR >>JERUSALEM AND IT WAS TO RESCUE >>THE HOLY CITY. 08:50 THEY THOUGHT IT WAS SOLOMON'S TEMPLE. 08:57 AND THEY PUT A CROSS ON THE TOP OF IT. 08:58 YOU KNOW, IT HAD BEEN REALLY >>SUPERIMPOSED ON THE OLD PILLARS OF THE ROMAN TEMPLE TO JUPITER. 09:20 ON ROMAN PILLARS ON JEWISH LAND. 09:40 AND OUR CATALOG WITH VIDEOS, BOOKS AND MUSIC. 09:48 READING PACKETS, TEACHING CASSETTES AND MAIL IN TESTS. 09:56 AND THE HOLY LAND EXPERIENCE THEME PARK IN ORLANDO, FL.? 10:00 PLEASE CONTACT US FOR MORE INFORMATION. 10:05 WELL, WE'VE MOVED TO ANOTHER SPOT ALONG THE MT. OF OLIVES, A LITTLE BIT FURTHER NORTH. 10:10 YOU SEE THE WILD OLIVE TREES ALL AROUND ME. 10:25 AND HERE ARE THE WILD OLIVE TREES MAKING THERE WAY INTO JERUSALEM. 10:29 YOU CAN ACTUALLY SEE IT HAPPENING ON THE HILL. 10:48 AND THE TEMPLE MOUNT AND IN FACT >>THE WHOLE COUNTRY. 10:53 BUT AT THIS POINT WE'RE A LITTLE >>PAST THE TIME WHEN COLUMBUS DISCOVERED AMERICA. 11:09 MADE A BARGAIN WITH THEM TO CLEAR OUT OF THE WAY AND THEY CAME IN. 11:14 GENERAL ALLENBY GOT OFF HIS >>HORSE AND WALKED INTO JERUSALEM. 11:26 DID NOT RIDE INTO JERUSALEM, BUT GOT OFF HIS HORSE AND WALKED IN. 11:30 THE BRITISH TOOK OVER AND HAD A >>MANDATE HERE BUT, THEY DIDN'T RUN THE PLACE VERY WELL. 11:38 IT'S ONE OF THEIR OUTLYING PROVINCES IN WHICH THEY HAD LITTLE INTEREST. 11:42 THEY WERE ALLIED MORE WITH THE ARABS THAN WITH THE JEWS WHILE >>THEY WERE HERE. 11:59 AND REESTABLISH THEIR ANCIENT BIBLICAL HOMELAND. 12:15 HE WAS A BRITISH PARLIAMENT MEMBER AND A BELIEVER. 12:26 FIVE ARAB NATIONS TRIED TO KILL THE BABY IN ITS CRIB, SO TO SPEAK. 12:44 AND SO IT WAS KIND OF A STANDOFF >>WITH JERUSALEM DIVIDED. 13:18 IT'S RIGHTFUL OWNERS, CAME BACK >>IN 1948 AND CHANGED THE NAME BACK TO ISRAEL. 13:28 THE SO-CALLED PALESTINIAN LIBERATION ORGANIZATION. 13:36 ABOUT WHETHER ARAFAT CAN BE BURIED THERE. 13:39 BY THE TIME YOU SEE THE PROGRAM, >>I'M SURE THAT'LL BE RESOLVED. 13:42 BUT, AT THE PRESENT IT'S A CONTROVERSY, BECAUSE HE'S NOT REALLY A STATESMAN. 13:49 HE'S NOT REALLY A PALESTINIAN. 13:50 I MEAN, HE'S AN EGYPTIAN, BORN AND EDUCATED THERE. 13:58 BUT IT'S UNCLEAR HOW THAT COULD >>BE AND HOW YOU CAN VERIFY IT. 14:02 HE CLAIMED TO HAVE FAMILY HERE. 14:10 SAID, NO, NO, KINGS OF ISRAEL >>ARE BURIED ON THE TEMPLE MOUNT, >>NOT EGYPTIAN TERRORISTS. 14:22 OF COURSE, IT COVERS THE FUTURE VERY WELL AND WE'LL SEE ANOTHER >>TEMPLE UP THERE. 14:33 A TEMPLE, AGAIN, OF SACRIFICE ON >>THE TEMPLE MOUNT DURING THE SEVEN YEAR TRIBULATION. 15:06 A TIME OF PEACE IN ISRAEL, AT >>LAST FOR THE WHOLE 1000 YEARS. 15:12 THE CHILD PLAY AT THE SNAKE'S DEN; EVEN THE ANIMALS WILL BE PACIFIED. 15:16 THIS IS A BUSY CITY OF COURSE, >>YOU CAN HEAR IT GOING ON BEHIND ME. 15:29 WILL TAKE IT'S PLACE AT THE HEAD OF THE NATIONS RATHER THAN WHAT IT IS NOW, HATED OF ALL NATIONS. 15:49 I SHALL STAND WITHIN THE WONDER >>OF YOUR WALLS, OH JERUSALEM. 16:00 BEAUTIFUL FOR SITUATION, THE JOY OF THE WHOLE EARTH. 16:05 SURELY THE LORD HAS BLESSED THEE >>AND MADE HIS FACE SHINE UPON THEE. 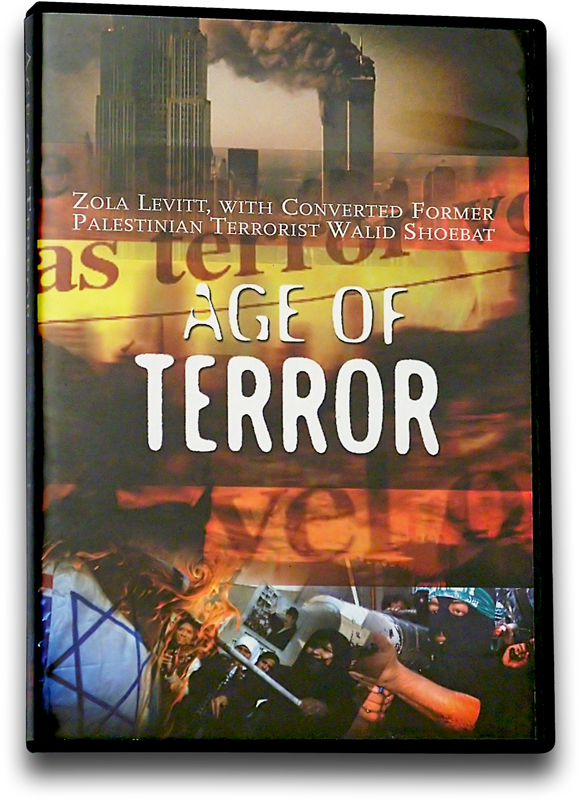 16:11 JOIN ZOLA LEVITT ON HIS NEXT TOUR OF ISRAEL. 16:17 COME TO ZION WITH SONGS AND EVERLASTING JOY. 16:23 COME, WORSHIP IN THE SPLENDOR OF >>HIS HOLINESS. 16:31 WELL, COME ON AND SEE ISRAEL FOR YOURSELF. 16:34 WE HAVE BEEN DESCRIBING IT ON AIR FOR 25 YEARS. 16:36 ONCE YOU GO THERE, YOU'RE GOING TO SEE THERE'S JUST NOTHING LIKE >>IT IN THE WHOLE WORLD. 16:42 YOUR LIFE WILL CHANGE COMPLETELY. 16:46 AND MANY PEOPLE WHO TRIED TO MOVE THERE. 16:48 IT'S NOT EASY TO DO, BUT SOME HAVE. 16:52 I CALL THEM GRADUATES. 16:52 THEY'VE GRADUATED TO LIVE IN ISRAEL. 16:55 AS OUR GUEST, WALID SHOEBAT >>GREW UP IN ISRAEL, BUT YOU GREW >>UP AS A JORDANIAN. 17:03 IN FACT, ZOLA, MY FATHER SERVED >>IN THE JORDANIAN ARMY. 17:05 THIS WAS WITHIN ISRAEL, NOW BUT >>YOU WERE CALLED A JORDANIAN. 17:09 MY FATHER WAS STATIONED IN JERICHO. 17:11 HE WAS WORKING AS A SCHOOL TEACHER. 17:17 WHO CAME AND PARADED IN JERICHO. 17:19 WE WENT TO THE THEATER, TO THE LOCAL THEATER. 17:25 YOU GOT WHIPPED YOU GOT HIT, SLAPPED AROUND. 17:28 YOU HAD TO SHOW A LOT OF RESPECT >>FOR THE KING. 17:31 TODAY WE HAVE TO DO THAT FOR MICHAEL MOORE. 17:34 THE PROBLEM WAS THAT WE DIDN'T KNOW WE WERE PALESTINIANS UNTIL AFTER THE SIX DAY WAR WAS OVER. 17:43 WE WERE PROUD JORDANIANS. 17:48 NOW WE WERE EDUCATED THAT WE WERE PALESTINIAN. 17:53 THAT'S A LITTLE BIT JARRING. 17:54 THE PALESTINIAN CHARTER NEVER INCLUDED JUDEA AS PART OF PALESTINE. 18:01 JUDEA WAS NEVER INCLUDED, ONLY AFTER THE SIX DAY WAR WAS WON. 18:06 THAT'S WHEN-- >>THEN THEY DECIDED THAT'S PALESTINE. 18:11 THAT'S BECAUSE THE JEWS CAN'T BE >>RULERS OF MUSLIMS. PERIOD. 18:13 WALID, IS THIS WHOLE THING >>ABOUT PALESTINIAN AND PALESTINE >>MADE UP? 18:18 IT'S, YOU COULD LOOK AT SOME OF >>THE NATIONAL ANTHEMS, THE PALESTINIAN NATIONAL SONGS. 18:25 I MEMORIZED ALL THE PALESTINIAN >>NATIONAL SONGS. 18:32 WHICH MEANS PALESTINE, MY FOREFATHERS, PALESTINE MY VENGEANCE. 18:37 SO THE TERM PALESTINE BECAME SORT OF A VENGEANCE AGAINST ISRAEL. 18:41 IT WAS CREATED AS A VENGEANCE. 18:43 IT NEVER EXISTED UNTIL ISRAEL TOOK OVER. 18:46 THIS PALESTINIAN CHARTER >>THEY ADOPTED, I READ THE THING. 18:49 30 PARAGRAPHS OUT OF 33 ARE ABOUT SOME OTHER NATION. 18:55 IN OTHER WORDS, KNOCKING ISRAEL. 18:56 WHAT KIND OF GOVERNMENT DOCUMENT >>PICKS OUT SOME NEIGHBORING COUNTRY JUST TO TRASH? 19:02 WE HAD NO QUALMS THAT EGYPT RULED GAZA. 19:07 JAMAL ABDUL NASSER RULED GAZA. 19:10 IN FACT, KING ABDUL ANNEXED JUDEA AND IT WAS ILLEGAL. 19:14 ONLY 2 NATIONS IN THE WHOLE >>WORLD ACCEPTED THE ANNEXATION OF >>JUDEA BY JORDAN. 19:22 THEY LIBERATED JUDEA FROM AN OCCUPATION BY JORDAN. 19:26 THAT WAS AN OCCUPATION. 19:27 AS A MATTER OF FACT, THEY TORE DOWN THE WALL. 19:31 ALLOWED EVERYBODY TO VISIT THE >>HOLY PLACES. 19:35 WHILE WE STONED YOU GUYS AND THE RABBIS DOWN BELOW UNDER AT THE WAILING WALL. 19:40 I WAS A PARTICIPANT IN THESE THINGS. 19:41 JERUSALEM WAS DIVIDED ORIGINALLY >>AND AFTER THE SIX DAY WAR, IT WAS NOT DIVIDED. 19:46 NOW THERE ARE FORCES THAT SAY IT OUGHT TO BE DIVIDED AGAIN. 19:49 THE LIBERATOR IS CALLED AN OCCUPIER. 19:52 THE ONE THAT BRINGS FREEDOM IS >>CALLED OCCUPIER. 19:55 ISRAEL BROUGHT FREEDOM TO THE PEOPLE. 19:56 ISRAEL HAS 15 RELIGIONS ACCEPTED >>AS PART OF ISRAEL. 20:00 THEY HAVE BLACK JEWS, THEY HAVE YELLOW JEWS, THEY HAVE EVEN ORANGE JEWS. 20:07 EVERY RACE IN THE WORLD IS THERE >>AND THEY CALL IT RACISM. 20:11 THE PALESTINIAN CHARTER SAYS IT WILL BE AN ARAB STATE AND ISLAM >>WILL BE THE STATE RELIGION. 20:16 THAT'S, TO ME, AMAZING BECAUSE THERE'S CHRISTIAN PALESTINIANS, >>THEY GOT NO SAY-SO. 20:22 OF COURSE THERE ARE. 20:25 BUT I UNDERSTAND THEY HAVE A LOT >>OF TROUBLES NOW. 20:29 THEY ATTEMPT TO COME AND PRAY AT >>THE CHRISTIAN HOLY PLACES IN NAZARETH. 20:39 TRYING TO SEND TO THE CHRISTIAN >>A MESSAGE THAT TOMORROW THIS WILL BE OURS. 20:43 TOMORROW WE WILL CONVERT THIS TO >>A MOSQUE, EXACTLY WHAT HAD HAPPENED TO JOSEPH'S TOMB. 20:49 WE LIKE TO EMPHASIZE ON KRISTALLNACHT, WHAT ABOUT "JOSEPHNACHT". 20:54 WHAT ABOUT THE EVE WHEN JOSEPH'S TOMB WAS DESTROYED? 20:57 THEY TORE IT APART. >>TORE IT APART. 21:04 AND ALL 16 HOLY PLACES IN JUDEA, >>JEWISH HOLY PLACES WERE DESECRATED, ALL OF THEM. 21:27 THEY SEEM LIKE MEN WHO LIFT UP >> AXES AMONG THE THICK TREES. 21:35 ALL AT ONCE, WITH AXES AND HAMMERS. 21:38 EXACTLY WHAT YOU SEE IN THE FOOTAGE. 21:40 THEY BURNED JOSEPH'S TOMB. 21:43 AND DESTROYING THE STONES AND DESECRATING THE PLACE. 21:47 PAINTING THE DOME GREEN, MAKING IT A MOSQUE. 21:49 IN FACT, EVEN RAKIM ASABRE SAYS >>THAT THERE IS NO SOLOMONIC TEMPLE ON THE TEMPLE MOUNT. 21:56 YES, THIS IS ONE OF THE MOST AMAZING STORIES. 21:57 THE TEMPLE IS MENTIONED IN GREEK >>HISTORY, ROMAN HISTORY, OF COURSE, JEWISH HISTORY. 22:04 A 34 ACRE STONE CONSTRUCTION ON FOUR LEVELS OF RAMPS, STAIRCASES >>ESPLANADES AND COURTYARDS. 22:13 THEY SAY IT NEVER, EVER EXISTED. 22:16 IN FACT, MANY MUSLIMS BELIEVE >>THAT THE SOLOMON TEMPLE EXISTED. 22:20 THE QURAN TALKS ABOUT SOLOMON. 22:23 MANY MUSLIMS RESPECT THAT. 22:34 A FRIEND OF ADOLPH HITLER SAYS >>EVEN THE WAILING WALL IS NOT >>PART OF ANY JEWISH HOLY PLACES. 22:42 IT IS CALLED EL BROQ WALL, IS WHERE MOHAMMED THE PROPHET OF >>ISLAM PARKED HIS FLYING ANGEL. 22:49 IN FACT, IF YOU GO TO RACHEL'S TOMB, THIS IS CALLED BILAL MOSQUE. 22:56 THEY'VE RENAMED EVERYTHING TO BECOME MOSQUES AND MUSLIM HOLY PLACES. 23:01 EVEN RACHEL'S TOMB NEAR BETHLEHEM. 23:04 YES, ALL THESE THINGS. 23:05 ACCORDING TO ARAFAT, EVEN JESUS WAS A PALESTINIAN REVOLUTIONIST. 23:09 JESUS CHRIST WAS A PALESTINIAN >>PROPHET, BORN IN BETHLEHEM, IN MY COUNTRY. 23:16 AND WE WERE CANAANITES AS WELL. 23:19 FISEL HUSSEINI TOLD ME THAT PALESTINIANS HAVE BEEN HERE 5000 YEARS. 23:23 I WATCHED THAT ON YOUR SHOW WITH AMAZEMENT. 23:28 BUT THAT'S WHAT WE LEARNED. 23:30 BUT THAT HE WOULD TELL A WHOPPER >>LIKE THAT AT SOMEBODY WHO OBVIOUSLY KNOWS BETTER. 23:36 JUST LIKE NAZI GERMANY, ZOLA. 23:51 TAKING THE MEDIA, ROBBING THE MEDIA. 23:53 ALL THIS JUST LIKE NAZI GERMANY. 23:57 IN NAZI GERMANY WAS FROM SPAIN >>AS A RESULT OF THE ISLAMIC FUNDAMENTALISM. 24:02 IF YOU LOOK AT THESE CALIPH AL MUTWAKEL, THESE ARE SOME OF THE >>GREATEST CALIPHS IN ISLAM. 24:06 MUTWAKEL INSTITUTED THE YELLOW >>PATCH ON THE RIGHT SHOULDER. 24:16 WHICH CAME FROM THE OMAR DECLARATION. 24:17 OMAR BIN AL-KHATTAB WAS THE SECOND CALIPH IN ISLAM. 24:20 HE DECLARED THE OMAR DECLARATION, THE OMAR EDICT. 24:29 YOU FIND THEM TO BE ALMOST IDENTICAL. 24:33 THERE'S ONE DEVIL AND WHOEVER HE >>EMPLOYS DOES THINGS HIS WAY. 24:36 BUT, THE SADDEST PART IS CALLING >>JESUS A PALESTINIAN. 24:47 IS NOW BEING MADE INTO AN ARAB, >>ARAB MUSLIM. 24:52 CAN YOU BELIEVE IT. 24:53 IT GOES EVEN AS FAR AS EVEN THE >>PALESTINIAN CHRISTIANS. 25:07 SO HE'S A PALESTINIAN REVOLUTIONIST. 25:08 MOSES WAS A PALESTINIAN REVOLUTIONIST. 25:11 ABRAHAM WAS A PALESTINIAN REVOLUTIONIST. 25:18 AND I WAS THE ONLY MUSLIM IN THE CLASS AND THAT'S WHAT THEY WERE >>TEACHING US. 25:22 WELL, WALID, YOU'VE PUT ALL THESE THOUGHTS IN YOUR BOOK. 25:27 WHAT IS IT, SOMETHING ABOUT YOU'RE LEAVING JIHAD OR WHY I LEFT. 25:33 IT'S CALLED "WHY I LEFT JIHAD". 25:40 THOUSANDS OF REASONS AND GO INTO DEPTH AND DETAIL AS WHY I LEFT JIHAD. 25:44 YOU WERE, LET ME QUALIFY, YOU WERE A TERRORIST. 25:47 YOU WEREN'T SOME BACKGROUND MUSLIM. 25:51 JUST LIKE ALL MY OTHER RELATIVES, THE COMMUNITY AND EVERYBODY ELSE. 25:56 IN FACT, IF PEOPLE WANT MORE INFORMATION, THEY CAN LINK TO MY WEBSITE. 26:07 HIS OTHER THINGS AND IT'S >>REALLY WORTHWHILE AND I REALLY >>RECOMMEND THIS MAN. 26:13 THEY SAY JESUS SAVES. DOES HE? 26:19 TURNS INTO A GENTLE BIBLE TEACHER OF GREAT KNOWLEDGE AND SINCERITY. 26:25 THERE REALLY IS A TAKEOVER GOING >>ON, ISN'T THERE? 26:34 AT UNIVERSITY LEVELS, AT ALL LEVELS, AT GOVERNMENT LEVELS. 26:38 YOU HAVE A MOSQUE IN THE WHITE HOUSE. 26:39 LISTEN, GET HIM TO YOUR CHURCH >>TO SPEAK, TOO. 26:43 YOU CAN CONTACT HIM ON HIS WEBSITE. 26:44 HE'D BE A FASCINATING MAN TO HEAR. 26:47 I'D LIKE HIM TO GET OUT IN THE CHURCHES. 26:48 AND SHA'ALU SHALOM YERUSHALYIM, PRAY FOR THE PEACE OF JERUSALEM.